The prophetic FMCG boss is on a mission to make business more sustainable. Unilever chief exec Paul Polman has reiterated his faith in combining commerce with sustainability as he called on business leaders to stop obsessing over profits. 'Profit is not a purpose, it’s an end product,' he said, according to the Telegraph. 'I always want a deeper result. People assume that if you do something good, it must cost money. I don’t know where they get that idea from,' he said. 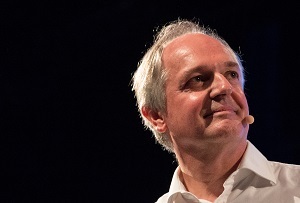 Polman, who once trained as a priest, was speaking at Unilever's Sustainable Living Young Entrepreneurs Awards, which recognises innovative small companies with solutions to the world's various problems. Environment and ethics are a big part of the company's business model, especially since Polman introduced its Sustainable Living Plan. He said that it would take $90tn (£59tn) of infrastructure investment over 15 years to build a sustainable economy to fight global warming. It's unclear where the figure comes from and it's certainly no small ask – annual gross world product was little more than $87tn in 2013. But then Polman doesn't have small aims. Unilever's most recent results are an interesting case - sales were struggling a little thanks to emerging market murmurings, but profits were up 5%. To shift the focus to long term growth, Polman also ended the practice of quarterly reporting. 'Our share price is up 25pc over the past four months alone, showing the world that you can address tough issues without touching the economic viability of your business model,' Polman insisted. That might be a bit tenuous – four months isn't a very long test case. Nonetheless, it seems that for now investors are impressed with Polman's approach.